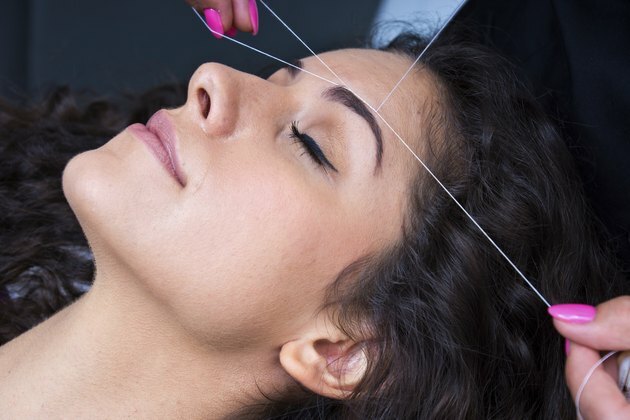 Once you open your eyes to the benefits of eyebrow threading, you may never go back to tweezing and waxing. The procedure is done by twisting two cotton thread strands together to capture individual eyebrow hairs and then pull them out from the roots. The result is usually smooth, hairless skin, but sometimes hair follicles can become infected with bacteria. Save face when this happens with a twice-daily cleansing routine and some benzoyl peroxide. Pull your hair away from your forehead and fasten it with a headband. Splash lukewarm water on your face. Pump a dollop of acne-fighting cleanser onto your fingertips and gently massage it over your entire face, especially the eyebrow area, to remove oil, dirt and bacteria. Rinse your face with warm water and pat dry with a clean towel. Pour some toner onto a cotton pad and wipe your entire face or just the pimply area. Choose a toner with witch hazel, whose catechol tannins help reduce the size of pores and push out dirt. Or choose a toner with salicylic acid, which not only breaks down the oil in the clogged hair follicle, but helps kill the bacteria in the pimple. Other useful ingredients include anti-inflammatories such as chamomile, aloe vera and allantoin. Dab a bit of benzoyl peroxide onto the pimples. Start with an over-the-counter 2.5 percent product and apply a thin layer onto the affected area twice daily. If that doesn't do the job in a couple days, and if your skin is not irritated or peeling, switch to a higher concentration. Apply a hot, moist compress to the area twice a day for five minutes to help drain the affected hair follicles. Apply a hydrocortisone cream to help relieve swelling and itching. Visit a board-certified dermatologist if the pimples get bigger or don't go away. You may need a prescription-strength antibiotic or topical cream. Refrain from squeezing the pimples. This can lead to infection or spread the bacteria to other areas of your face.